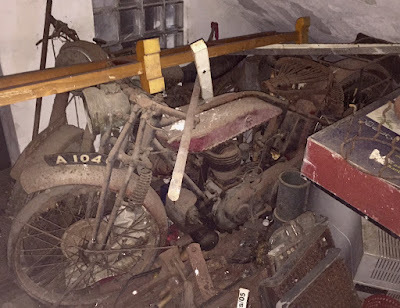 -SG- Alastair - owner of a 1930 Model 18 which he is getting back on the road - has been in contact about a rather remarkable discovery ... here's what he says: "I have just returned from a holiday in Sri Lanka and discovered this old 16H (looks like '27/'28 - SG) tucked away under the stairs of a Buddhist temple in the centre of Colombo. It was almost completely dark hence the poor photo and I couldn’t get any closer to have a look for numbers etc. Next to it was a mid 50’s BSA of some sort. The temple was also full of old Rolls Royces, Austins, Armstrong Siddeleys and masses of bric-a-brac, stuffed elephants etc as well as the usual religious iconography! I believe all this stuff to be past offerings ... clearly Motorcycles (even Nortons) are not worthy of display! It is not for sale or ever would be, besides anything of 25 years old is considered an antique and very difficult to export without a license.